Anyone who likes good coffee should have this espresso maker at home. The Bialetti is a stainless steel, stove top espresso maker , that produces 4 cups of rich, authentic Italian espresso in just 4-5 minutes. Bialetti also has the 2 or 6 cup option although I think the 4 cup is an optimal size, and you can use it just for two cups just by pouring less water in. The Bialetti is made from stainless steel so it should’nt rust. To protect the maker , you are advised to use an electric stove top or low gas flame. For best results remove from heat source the moment the coffee is ready. Excessive heat or high flame can damage the stainless steel. How do you know it’s ready? It takes a few minutes or as soon as you hear the water bubbles. When it does, it means there is no more water to push up from the water reservoir to the coffee reservoir. To keep your coffee maker good as new, wash it as soon as you are finished with the coffee. You don’t have to scrub it, just tap water maybe and a bit of soap will do. Wash excessive water and keep the bottom reservoir dry when you store it. 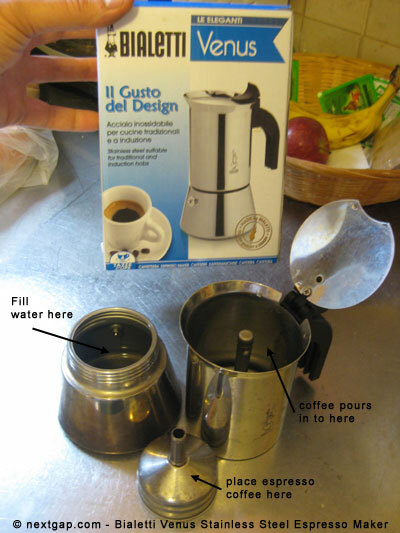 Bialetti also makes aluminum model (I have it too) but the aluminum is less durable to soap, heat and oxidation.